The B.A. in Theatre Arts: Performance and Practices is focused on contemporary theatre-making practices and is designed to provide the multi-talented performer-entrepreneur with the environment and tools needed to create, develop and produce innovative, imaginative and thought-provoking theatre. 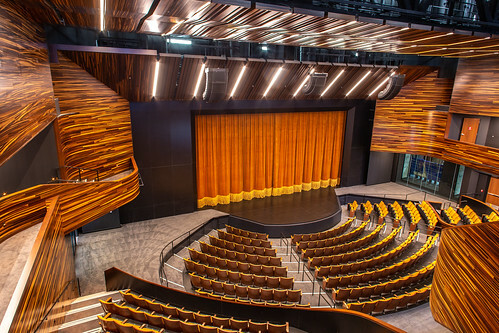 Working in our Pittsburgh Playhouse, a three-theatre national laboratory for young artists, students in this program will be part of developing new projects and practices - under the guidance of professionally active faculty - connecting multiple disciplines in state-of-the-art facilities. Students are immersed in courses and opportunities that explore creativity, aesthetics, design, playwriting, directing, producing, devised work, ensemble and social justice, among other theatre topics, along with a rigorous sequence in core academics. Students also have internship, casting and other professional opportunities within the theatre community of Pittsburgh. Students in the 120-credit program have the option to pursue minors, a double major, study abroad and may, with summer coursework, complete their degree in three years. Wednesday, February 27, 2019 "It’s comforting and exciting to see Point Park fostering connections with professional theaters. It’s an example of the fact that training is working; script analysis, movement, and voice and speech are all pivotal to telling this story with justice," said Vanessa Vivas, theatre major. Friday, January 18, 2019 Peter Matthew Smith, a former Point Park theatre major, and Edred Utomi made their Pittsburgh Playhouse debut hosting a Q&A with students. Smith is "King George III," and Utomi plays "Alexander Hamilton." Theatre Faculty Q&A: Tim Marquette, M.A. Wednesday, February 20, 2019 As an actor, singer, stage director, musical director, vocal coach and accompanist, Tim Marquette, M.A., has enjoyed working in the United States and around the world.